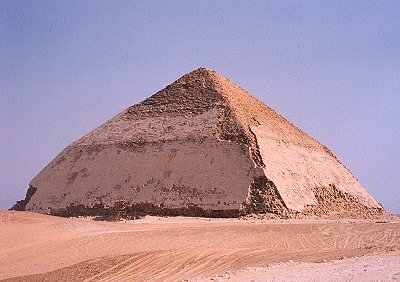 Way back in the long-ago I wrote a little paper on how to build a pyramid using nothing but ancient tools and techniques. It was a thought experiment, done without real research, but every bit of archaeology I've seen since then tends to support my initial thoughts in every important detail. For instance, My hypothetical pyramid would take around 20,000 people to build, including all support staff, from doctors to potters to cooks. The core number of builders was 15,000. My hypothetical pyramid would have been completed in 20 years. Click to read "How To Build A Pyramid"
There's a nice piece in Livescience.com that details how the builders of an actual pyramid (the pyramid of Menkaure) were fed. The article estimates a workforce of 10,000 builders. Since the pyramid of Menkaure is a bit smaller than my hypothetical one, and mine is built on a more aggressive schedule, I'm quite pleased with my estimate of 15,000. I'm also still happy with my 5,000 man support staff. I'm sticking with both of those. Re-reading my article, I note that I promised a follow-up, and I suppose I should write that. Before I do, though, I'd like to go ahead and answer a few observations and questions raised by a colleague of mine, Russell, in a theological article of his own. Then maybe I can turn my thought to those other matters I said I'd address. OBSERVATION: the units used in my calculations are purely arbitrary. Answer: No, they're not. I used only one unit, the cubit, which was a well-attested Egyptian standard. However, the number of cubits is to a great degree, arbitrary. It always is. We're constrained by budget, ability, and desire. I started with 280 cubits in height, but I could have just as easily marked out acreage first. The end result is the same. Basically, I chose the height that I did for two reasons: My pharoah wants his pyramid to be taller than his dad's, and his architect picked a number that worked out to integer math. Do not underestimate the value of that "integer math" requirement. Decimals were unknown back then, as place values and the zero hadn't yet been invented; and fractions and multiple units of measure are notoriously error-prone. You really don't want to deal with any of that on a large project. QUESTION: Why did the Egyptians not roll the wheel 4 times or 6 times instead of 5? Answer: Experience. This isn't the first pyramid they built. These things didn't just jump into existence... there is a solid record of the evolution of Egyptian pyramids, which I'm about to show you. At each stage the Egyptians learned something that they applied to later constructions. Build a pyramid too shallow and it's not impressive. Build it too steep and it crumbles. Shallow pyramids were the first to be built. They are now called "mastabas", but the ancient Egyptians called them by a word meaning "houses of eternity". A mastaba resembled a bunker built over a shaft leading to the burial chamber. The feature of a subterranean chamber was retained right up to the building of classical structures like the pyramids of Menkare and Khufu. The Step Pyramid of Djoser was basically a series of mastabas sitting one atop the other. It had no "slope" per se. (BTW, step pyramids were quite common in the ancient world. They were called "ziggurats" in Babylonia). 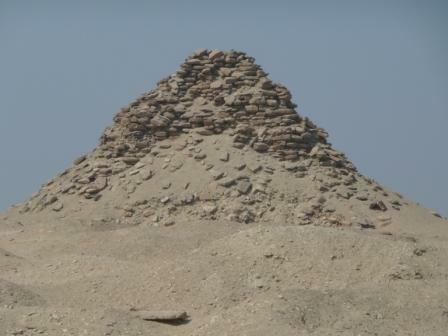 The first true pyramids DID crumble... the pyramid of Djoser is surrounded by examples. This is what happens when you build them too steep. In fact, we have a stable example of a case where they tried to use a different ratio... this is the "Bent Pyramid". Halfway through its construction it became evident that the slope was dangerous and unstable, and the builders corrected it. That's the kind of permanent public embarrassment that no one ever wants to repeat. THIS is what happens when you admit your mistakes. The slope that was eventually used very nicely approximates the slope of a sand dune (and that at which the crumbling pyramids settled), while still using integer math. In other words, you heap stuff up and it tends to stay that way on its own, making this a very stable design. BTW, the Egyptians weren't the only pyramid builders... the Ethiopians built many smaller pyramids with a steeper slope. Question: Why is it NECESSARY to roll the wheel FIVE (5) times in one direction and FIVE (5) times in the opposite direction to yield the correct results? Answer: As you can see above, it isn't, and from reading my article, you note that they did not measure multiples of five. Rather, the height was 280 and the base was half that number of turns, or 140*pi. That's 70 turns out from the center. Not five. So our 70 turns times the circumference of our one-cubit diameter odometer should give us about 220 cubits. It actually works out to 219.9 and change, which is so close to the integer answer as to not matter to our Architect. The number five really has nothing to do with anything in this discussion. You can pick any height you want, but it's easiest if it's a multiple of four if you want this slope. That's purely because you'll be you'll be cutting the number in half for the total length of the base so it's structurally solid and aesthetically pleasing, and then in half again if you intend to measure out from the center. In other words, we're just sticking with integer math, that's all. But four fingers + one thumb gives my friend the "five" he needs for his theological discussion. Remember that my article details what the builders most probably did do. If they had used a different slope, the "correct" results would have been different. However, the "correct" results that we actually see are strongly driven by experience and physics for a structure of this size. We've seen that smaller structures have completely different slopes, and we've seen that they structurally fail when scaled up. Nevertheless we do find reasonable variation in the slopes of all pyramids, which should curtail the argument that any particular ratio is "necessary". Also note that myriad numerical coincidences and relationships would still have existed had they chosen a different slope... they'd just be different from the ones you have now. You'd just be focusing on those instead of the one you have, drawing similar theological conclusions and concluding that they are also somehow "necessary". For instance, if we had divided the height by 3 instead of four (despite the resulting fractions), we'd have insisted on theological comparisons resulting from the number three (such as the trinity, or past-present-future). If we'd used five instead of four then we could use the same relationships my friend does now without having to refer to the fingers + thumb kludge. If it had been six, then we could invoke the Magen David and the six days of the Creation. And so it goes. Instead of pi, we could be discussing tau. Pick any number whatsoever, and you can construct a series of relationships, all of which are "important", "necessary", and "beyond coincidence". Cherry-picking the numerical relationships that necessarily exist is closely related to the "anthropic principle". The weak anthropic principle is an unremarkable tautology while the strong anthropic principle is a logical fallacy. Question: His Pharaoh wanted a height of 280, nothing else. They would have had a pyramid 20 diameters in height, but no demonstration of Pi had they chosen any other model than 5 rolls of the wheel. Is Dave saying that the builders did not understand Pi (no advanced technology) and therefore found it by accident? Answer: Yes, that's exactly what I'm saying. Furthermore, I'm saying they didn't even "find it" if by "find it" we mean that they realized its significance. By the way, it doesn't matter how many rolls of the wheel we're talking about. The only thing that "encodes" pi into the design is that we're using a cubit both for the diameter of the wheel and for any other measurements we make, and that the builders prefer integer math. ONE roll of the wheel and ONE cubit height would still "encode" pi into the design. ONE roll and THREE cubits height would do the same. The only way to eliminate that "encoding" is to use some other wheel diameter, which means arbitrarily mixing units of measure, which is exactly what I did not do. A cursory reading of the Bible would give you a value of 3 for pi[*]. But there's no evidence that the ancient Egyptians understood pi as anything useful or special. A primary use for pi is to calculate the area of a circle. But an ancient textbook the Rhind Mathematical Papyrus, does this (imperfectly) by a completely different method. In a compelling blog post, Jason Dyer has some more thoughts on that. Pi is never acknowledged in the Rhind Mathematical Papyrus, but to the extent that it is implied, it would equate to 256/81, or about 3.16. Since the Egyptians' knowledge was actually written down, and we have a textbook, we know that any value more accurate than that is accidental. Also, the "280, nothing else" isn't as dictatorial as it's made to sound. As I stated above, the pharoah would have arrive at this number through consultation with his Architect. He'd want it bigger than his predecessors', but still allowing for integer math. A list of numerical coincidences follow Russell's questions, and most of them require the use of "pyramid inches". The problem with that is that "pyramid inches" are made up. The reason the coincidences occur is that the coincidence was assumed from the start, and the value of the pyramid inch was adjusted until its "correct" value was "deduced". There's no archaeological evidence for any such thing. Why would the ancient Egyptians have any interest in recording or predicting the exact dates of the birth of Adam, the Exodus, or the birth, baptism, and crucifixion of Jesus? If they call all that right in exacting detail, how did they manage to flub their entire pantheon, as well as the entirety of their cosmology and escatology? These are far more difficult to answer than whether the builders used integer math and wheels. As I mentioned in my original article, it is a perfectly valid rhetorical device to use a thing to illustrate an idea. We just shouldn't get so caught up in it that we mistake our illustration for the builders' intent. When we do, we run the risk of letting the minute details a carefully crafted cosmology detract from the bigger message. This 2007 issue of Archaeology magazine describes Jean-Pierre Houdin's compelling theory on construction techniques, none of which involve space aliens or super-science. Click on the magazine cover to read the article. [*] of course, the Bible isn't a math textbook, and 3 is close enough for the narrative in 1 Kings 7:23-26 given all the talk of "hands-breadths" and fluted rims. Nevertheless there's almost a branch of apologetics devoted to this numerical "problem". Usually these involve using the "hand's breadth" thickness to take the outer diameter of the bowl and the inner circumference, these being the diameter and circumference of the mold. But the most inventive answer, sure to appeal to math geeks and gematria buffs, is this one. You're right, Passover is it's own thing. What's your position on Easter; superimposed upon an ancient holiday or whole-cloth Christian? That's a good question, and before we begin we should remind ourselves of the principle of human nature and remind ourselves of the nature of religion and spirituality. Also, let's keep focused on the discussion of the seasonal holiday... that being fertility rites, such as those for Ishtar or Eostre, or at least something that parallels the Christian observance. Also, consider that this is a very different question from the one I asked originally... I asked whether Passover was derived from another holiday... here the questioner asks if Easter is superimposed upon another holiday. While acknowledging that I see the switch, I'll address both questions here with respect to Easter. It's no mystery that Easter very blatantly takes the spotlight from the ancient Jewish holiday of Passover in the Christian calendar, though the calculation of the date was changed and standardized by the Nicene Council, and though some modern Christians have taken up observance of Passover, as there's nothing in Christianity to preclude it. Regarding the Last Supper (which became the Eucharist)... while the season of the event was unquestionably that of Passover, there is legitimate doubt as to whether the Last Supper depicts a Passover celebration. Certainly it has little resemblance to the Seder. There are no bitter herbs, etc., and none of the traditional observance. It is reasonable to conclude that the Last Supper was simply a shared meal. In this sense, the Eucharist is not connected to Passover. Update: My friend Mark points out: "It's hard to argue that the Last Supper wasn't a Passover Seder when the Haggadah hadn't been formalized yet. I'm not sure we have a solid idea of what a Seder looked like at that point in history. Granted, it's similarly hard to argue under those circumstances that the Last Supper *was* a Seder." Mark's absolutely correct. However, we do know that the symbolism of the Eucharist is not that of the Seder. Whatever connection there might have been is broken. Update 2: Besides, John 19:42 says that Jesus was crucified on the Jews' preparation day, which would argue in favor of a standard meal. There's a healthy controversy on the subject. Update 2: Dr. James Tabor provides a convincing argument from scripture that the Last Supper was not a Seder. Given the plain reading of it, I'd now say it's NOT difficult to argue the point that they were separate. You can read Dr. Tabor's article, "The Last Days of Jesus: A Final “Messianic” Meal" at Biblical Archaeology Review. As the questioner notes himself, Passover is its own thing. Easter draws on Passover for the season and the culture. The entire story of the Christ is essentially Jewish, and draws heavily upon the writings of Old Testament Jewish prophets, notably Isaiah, Zechariah, and the Psalmists. Christian apologists will readily point you to the plethora of prophesies pertaining to every aspect of Jesus' ministry. The evangelists wrote that Jesus himself was aware of these prophesies and declared he had come to fulfill them. So HEAVY borrowing from Judaism is a given, though it really can't even be considered to be "borrowing" at all, as the earliest Christians were themselves Jews. Christianity is not a mystery religion. ALL of the symbolism of the Passion is fully explained in the gospels, authored by** people who were or who knew witnesses. However accurate these accounts may be, it's not as though they were writing myths about their distant past. There was a teacher named Yeshua (Jesus), and he was crucified. A group of witnesses very strongly believed him to have risen from the dead. This does raise the question, "since everything is there in Old Testament prophesy and contemporary Jewish practices, why would they need to borrow anything else?" And the answer is, of course, they didn't need to. We've already discussed Ishtar and Eostre. There are secular aspects of Easter that lean heavily on Eostre, but that's normal for the season, explained by human nature, and don't have anything to do with the Christian observance of Easter Sunday. And by the Christian observance, I'm talking about the things you'd see in a church, not in a Wal-mart. That is, a recounting of the Passion, including the Last Supper, the story of the women finding the empty tomb, Jesus revealing Himself, and his Ascension. None of this has the slightest to do with fertility rites. The closest you can come to this is that his resurrection is a parallel to the "rebirth" of the season. The problem there is that pagan rebirth is cyclical; whereas Jesus promises eternal life. These are fundamentally different concepts. These are the sort of things we must look for when we say that Christianity borrowed this holiday from another religion. (the "superimposed upon" question is a lot easier... you just look for another holiday at the same time and see if Easter stomps on it). Looking a little beyond the holiday now, other figures "equated" with Jesus are the Egyptian Horus and the Zoroastrian Mithra, though I know of no writers who ever stated that they knew Horus or had dinner with Mithra. HORUS is floated as a precursor to Christ because of his death and re-birth. It's claimed that Horus was born of a virgin, though the actual tale is that his mother was a goddess, not a human, and she was impregnated by the phallus of the dismembered god Osiris. Though perhaps a supernatural birth, it's not virgin, and that's really more a discussion appropriate to Christmas, anyway. Commonly, proponents of the Horus "connection" conflate Horus and Osiris in claiming a resurrection. However, Osiris, having been dismembered into 12 pieces and re-assembled by Isis, was not restored to life, but became lord of the underworld. Regarding Easter, the pertinent question here is, was Horus (or Osiris) connected with some festival involving resurrection or rebirth? In a way... Osiris' rebirth was linked to the annual flooding of the Nile river. This was central to all aspects of Egyptian culture. One big problem with claiming that Easter is a re-packaging of that is, of course, that the Nile floods in August. It is true that, like the Egyptians, the Jews and Christians teach of an afterlife (as do almost all religions). Most ancient religions, however, teach either of an underworld, or reincarnation followed by another death, or a merging with the godhead; whereas the Judeo-Christian teaching is that of resurrection into a physical, incorruptible human body in a physical world, everlasting life, and retained individuality. But first... for those that don't know, Zoroastrianism is a religion that was, prior to Islam, dominant in Persia and which developed around the same time as Judaism. Being further East, it has a particular "Indian flavor". There are still thousands of actively practicing Zoroastrians in the world, which ain't bad for a religion as old as this. Zoroastrianism teaches dualism, but is in some respects similar to Christianity and Judaism in its broad teachings, with some differences. For instance, Zoroastrianism stresses good works: Christianity teaches that salvation is achieved through grace, but that good works are the "fruit of faith". As James writes, "I will show you my faith by my works." Notably, Zoroastrians teach that at the end of days the dead will rise and a savior will renovate the world and the dead will be given immortality in perfect, incorruptible bodies. Sounds pretty similar, right? And Mithra is the Zoroastrian god of covenant, which would seem to perfectly place him as the final judge at the end of days (the "Frashokereti"). Except that Mithra is never identified as that savior, and the final judgement of the Frashokereti will be by ordeal... you'll have to walk across a river of molten metal, and wicked will be burned away. But we're looking for Easter. There is no Zoroastrian analog to the Easter observance, or to the Passion, or even a Spring festival. The closest would appear to be Mehregan, but that's celebrated in October. But that's not really the ONLY source of traditions about Mithra. The ROMAN empire adopted some of the features of Zoroastrianism into cultic practices known as the Mithraic Mysteries, or "Mithraism". This has a similar relationship to Zoroastrianism as Christianity does to Judaism... you see the line of descent, but the details of the older religion are washed away in practice. So how does all this get us to a precursor to the Christian Easter? It doesn't. Observance of Christ's resurrection was the very first, most central practice of Christianity. It is the core of the religion. The Nicene Council standardized the date, but no one waited for that group before celebrating it... it was celebrated all the time, from the first. Remember that everything about the Christian liturgy is based on the scriptural gospels, and by word of mouth prior to that. All of the events reported there are intended to illustrate the fulfillment of Jewish prophecies. The Messianic movement was THE Big Deal for the Church founders, and this is where they expended their energy. Mithraism lasted from the 1st through the 4th centuries of the common era. There's nothing said about them prior to Christanity. There is no reason for Christianity to have borrowed from them, and indeed nothing that they could have borrowed that wasn't already in Judaism. ISLAM didn't begin until the year 610, with the prophet Mohammed, so no connection is possible. (Here is an Muslim's view of the Middle East before Islam). Besides, as with Soviet Russia, "You don't step on Islam..."
As we've previously discussed, the Christian festival of Easter doesn't borrow from any pre-existing pagan fertility rite. It is named after the ancient Saxon name of the month. The liturgy has nothing whatsoever to do with fertility, and it is impossible for Easter to fall on the vernal equinox, known to European pagans as Ostara. Therefore it's not derived from those celebrations. However, the trappings of Spring fertility festivals have been grafted on to secular Easter, though that's not the doing of the Church. Eostre is no longer worshiped because her entire religion has been abandoned. Yet this festival survives, though we never celebrate it on the day of Ostara, the vernal equinox. In this sense, Easter replaces Ostara, though it is not superimposed upon it. We continue the celebration of Spring as Anglo-Saxons have before their recorded history. This coexists with the Christian religious festival. One takes place outside the church; the other inside. Also, as I mentioned above, there was a Messianic movement in those days before and after the life of Jesus of Nazareth. These messianic beliefs were documented by the Essenes of Qumran. According to Josephus Essenes were common and widespread, and it's reasonable to assume that their beliefs would have been broadly known at that time and place, as the ideas espoused by Jesus most closely resemble theirs. Many would-be "messiahs" showed themselves [pdf], but important to this question at hand, absolutely none of them qualify as having been the subject of an "ancient holiday". Also, it's pretty obvious that Zoroastrianism and Judaism were informed, if not by the same source, then by similar philosophy. This is to be expected in the same region, at the same time. But the time in question -- as early as the 14th century BCE -- is so far removed that we have no way of determining which was first, or whether they both derive from an even older source, or even if a couple of guys talked it over and went in different directions to flesh out their ideas. But there's no ancient analog to Easter in Zoroastrianism; therefore it's impossible to conclude that Easter was derived from or superimposed on anything from that religion. We should keep in mind that these earliest of these possible formative dates approach the very beginning of civilization, and there's a limit to how far back the "borrowing" can go. While there is undeniably a common thread to the history of mankind, and every culture is informed by those around it, the idea that all cultures steal from older cultures isn't a terribly realistic one, nor does it make a great deal of sense when we comprehend that -- contradicting the anonymous author of Ecclesiastes -- in all things SOMEBODY had to be first. Certainly in this age of nuclear power and electronics, Big Bang theory and evolutionary biology, we're not so naïve as to believe there's nothing new under the sun. Whole cloth, though woven with the same thread as used by other religions. At the same time, I have no problem with it being considered superimposed on both Passover and Eostre. ** Update: originally "authored by"